One of the hottest concepts in strategy and management today is the idea of "open innovation." Gone are the highly secluded R&D departments funded by a single company, carefully guarding secrets from the outside and even from other divisions. In its place, in theory, are hubs of collaboration capturing ideas from customers, academia, or some guys in a garage somewhere. Given the simultaneous growth of the sustainability movement, it's no surprise that companies are starting to combine the concepts and try to create open green innovation. The general idea of this new collaborative approach to innovation has been kicking around since the 2003 publication of Open Innovation by professor Henry Chesbrough at UC Berkeley (see a recent article he wrote with some key examples here). But it's been gaining real currency in recent years as (a) large companies such as Procter & Gamble and IBM have embraced the concept, (b) the platforms for accessing many brains through social media have evolved, and (c) companies have looked for low-cost innovation pathways during tight times. The green shade of open innovation has appeared more recently. Earlier this year, Nike, Best Buy, Yahoo!, and a few others launched the GreenXChange, an organization dedicated to sharing patents and ideas that can help companies reduce their environmental impacts. The core non-corporate partner is Creative Commons, the godfather of modern idea sharing and an organization "dedicated to making it easier for people to share and build upon the work of others." I met some of the key players in the GreenXChange consortium — and saw Professor Chesbrough speak — at the recent Sustainable Brands Conference. Nike managers described how this fascinating agreement to share patents works in practice. Earlier in the 2000s, Nike had developed a "green rubber" that lowered production costs and slashed toxic emissions by 96 percent. The company offered up this technology and the Canadian outdoor equipment company, Mountain Equipment Co-op, licensed it (for what I sense is a nominal fee) to apply to its products. Members of the GreenXChange contribute patents for new methods of production that reduce energy, water, toxicity, and so on. Each company can learn from and build on what has come before. As the Nike managers put it, companies have latent ideas and technologies sitting on shelves, not being used. Why not let others in? Is open innovation a great thing for sustainability? A couple of major points in its favor: First, it certainly represents heretical innovation of the innovation process itself, and I'm big proponent of asking heretical questions. Second, the energy, toxicity, waste, and water challenges the world faces are so great and pressing, we don't have time to wait for every organization to discover cleaner ways of operating on its own —- we need to share information and speed up adoption of new methods and technologies. We need cooperation across traditional boundaries and open innovation to solve the biggest problems, and that means companies sharing much more than they're used to. But I'll admit to having one major reservation about this innovation strategy. One of the core arguments for going green is that it creates competitive advantage, a logic that makes sustainability palatable to many corporate leaders. A skeptical executive would be completely right to ask, "Won't sharing our ideas level the playing field and give away the keys to the candy store?" Imagine getting your patent attorney on board. Well, Nike execs brought theirs to the conference and he talked about his personal journey to seeing the value — to society and to Nike — in exchanging patents. I asked the manager leading the GreenXChange project my core question about giving up competitive advantage. Her logic was interesting. When the company discovers something like green rubber, "people" (meaning, I think, their employees and other key stakeholders) expect the company to do the right thing and spread the word — and so Nike does just that. But there are certain kinds of innovations the company wouldn't share. The ideal shoe, this manager imagines, would likely be made from one material (which would greatly reduce its material use and lifecycle footprint and make recycling very easy). If Nike could accomplish this feat, the new geometry and design would be all Nike's, and thus a source of real advantage. In the end, I come down firmly on the side of supporting open green innovation, especially given the scale and nature of the challenges we face. But for each company, the supporting logic for open green innovation will need to be balanced by a good understanding of where and when to share ideas, and which ideas are unique to the company's core competencies — such as design and branding, in Nike's case. Those latter ideas will drive profit and advantage. For now, it seems that Nike has this delicate balancing act down. Tags: Best Buy, competitive advantage, Creative Commons, GreenXchange, Henry Chesbrough, IBM, Mountain Equipment Co-op, Nike, open innovation, Procter & Gamble, sustainability, UC Berkeley, Yahoo! Last week we asked, "Is Water the Next Carbon?". Although our short answer was "no," we believe that managing water will become a critical business skill for the 21st century. Need drives innovation, so this week we want to highlight some of what is happening in the new markets in water. First, even large companies are carving out new niches to help businesses and communities manage water scarcity. For example, GE's investment in water technologies is well known, and its leadership stems from its ecomagination portfolio of products. GE not only recognizes the critical role technology plays in addressing water scarcity, it also understands the challenging interconnection between energy and water: increasingly, the world will be needing low-energy water treatment technologies. Another major industrial company moving to address water risk is ITT, the world's largest supplier of pumps and systems to transport, treat, and control fluids. ITT has a stake in seeing cities and companies invest in water management, but the company is discovering a relatively low level of awareness of the need. ITT conducted a survey titled "The Value of Water" highlighting both how much water we waste and exploring the critical gap between the current price and the real value of water. We spoke with Colin Sabol, a Vice President at ITT, about the survey and ITT's goals. In the US, ITT tells us, about 650 water mains break each day at a cost of $2.6 billion per year. Our crumbling infrastructure on the whole loses 1.7 trillion gallons of water per year, equal to the water use of 68 million homes. On the positive side, approximately 95 percent of individual consumers said water was the most important service they received in their home. And consumers said they'd pay more for improved water infrastructure. The business community was another story, however. Three-quarters of corporate respondents told ITT that they take clean water for granted. As Sabol says simply, "The infrastructure is literally out of sight, underground." That's why ITT has a big challenge in conveying to its customers the importance of investing in its services. But if this shift in thinking happens, the business opportunities are likely to be vast. Secondly, it is often innovators who must lead customers down new paths, showing them new ways of managing a resource and saving money that they didn't know were possible. So in addition to large multinationals such as GE and ITT, there are a number of startups in the process of bringing new technologies to the water industry. Several of these innovators participated in recent competitions such as the annual ImagineH2O and the CleanTech Open. Both of these groups may play a crucial role in creating an ecosystem for water innovation. This year's ImagineH20 finalists illustrate the diversity and imagination of the entrepreneurs paying attention to the opportunities in the water industry (here is a sample of these innovators — you'll see a couple themes, including capturing wasted energy in the water system). Agua Via developed a nanotech membrane that enables desalination at a 66 percent energy reduction and 50 percent cost reduction, providing energy efficient purification and wastewater remediation. BlackGold Biofuels recovers energy from wastewater streams, creating lucrative renewable energy assets from pollution liabilities. FogBusters treats petroleum, biofuel and food processing wastewater "better, faster, cheaper, cleaner and greener" while capturing the FOG (fat, oil and grease) to make into biodiesel. NLine Energy, Inc. converts wasted energy found in water transmission and distribution systems into renewable energy. Puralytics, winner of this year's CleanTech Open, uses photochemical processes work to break down or remove contaminants from water. Water Resources Management Co. helps water utilities realize the full benefits of their investments in advanced meter reading, system control and asset management. To get a sense of what companies are doing about water, check out these and other ImagineH2O finalists as well as the work of ITT and GE — they all highlight the exciting business opportunities and challenges in the water industry. It's a space worth watching as these challenges are expected to become more pressing in the coming years. Guest co-blogger Will Sarni is a director with Deloitte Consulting LLP and leads Enterprise Water Strategy for Deloitte's Sustainability Services. He is an internationally recognized thought leader on sustainability and is the author of the upcoming book Corporate Water Strategies (Earthscan). The auto industry is arguably going through the most significant change in its history. The race to a future filled with clean cars that use a variety of new technologies is on. At the big Detroit auto show this month, companies are falling over themselves announcing green initiatives and products. Tucked into this year's Fortune 500 issue is a short article on the annual Rice University Business Plan Super Bowl. With $1.3 million in cash, equity, and advice in play, this contest is one of the world's most prestigious and richest competitions for budding entrepreneurs. It also provides some insight into what MBAs and VCs are excited about today. If these entrepreneurs are our future business titans, then I'm feeling pretty good about where we're headed. In short, next-gen leaders want to build businesses that solve sustainability problems. Here are a few of the 6 winners profiled in Fortune. 3rd Place: PK Clean from MIT designed a factory that converts carbon-containing waste like plastic into fuel. 4th Place: cycleWoodPlastics from University of Arkansas developed a biodegradable plastic bag to replace grocery bags, which are increasingly being banned around the world. 5th Place: SmarterShade from Notre Dame created an elegant technology that adjusts the tint on windows, saving on building cooling costs by preventing heat gain. 1st Place. TNG Pharmaceuticals from University of Louisville developed a vaccine for a parasite that strikes cattle, costing the dairy and beef industry over1 billion a year. The winning team pointed out that, compared with the current industry "solution" of ear tags to mark the sick cattle, their method is cheaper and "greener" (it reduces pesticide use and increases milk production, thus making the industry more efficient and saving lots of energy). The other winners, FYI, were a better human authentication tool for websites and a material science innovation, a heat-resistant filter made from titanium dioxide. So out of the six winners, call it three (and part of the TNG pitch) were green-focused. I'd say that three and a half out of six is a darn good ratio in a competition that was not intended as a sustainability contest. And these entrepreneurs are working on some of our biggest problems — buildings represent about 40% of all energy use and emissions, waste is the new frontier in fuel sourcing, and the cattle industry is one of the largest sources of greenhouse gas emissions. Given the outcome of this year's contest, perhaps what the judges and competitors are telling us is that every competition needs to be about sustainability now. We're facing a tough future for our species if we don't turn the power of all of our institutions — business, government, academia, NGOs, and communities — toward solving our biggest challenges. Luckily for all of us, these bright young minds, our future business leaders, are excited to tackle these problems (and make gobs of money doing it). Are you ready to innovate and find solutions for our toughest sustainability challenges? Will you be able to attract the best and brightest talent to your organization if you're not? I recently contributed to an interesting website/online discussion, built by CNBC and Harvard Business Review (and sponsored by Shell). The topic is Sustainable Mobility and it's part of a larger series called "Energy Opportunities." CNBC taped three people providing a perspective on mobility and posing some 'challenges' to us all. First up was Bill Ford discussing gridlock and challenges of moving people around in a crowded world. Second is me, with a question that frequent readers of mine will recognize -- "How do we encourage heretical thinking?". My 2-minute video is totally animated, which is cool. The third perspective comes from one of my heroes, Jaime Lerner, the former mayor of Curitiba, Brazil. He's one of the most creative thinkers on sustainable cities, and he built the first real bus rapid transit system in the world, and it's now a mass transit system in 120 cities. Lerner asks people to reimagine cities as places to mix peoples of all incomes and backgrounds. I believe in science and facing facts or, to borrow words from an important awareness-building event today, I believe in “climate reality.” I'm donating my Twitter feed and this blog space to point people to the Climate Reality Project , Vice President Gore's latest attempt to light a fire under everyone about our climate. In my work, I try to convey the benefits of going green to executives around the world. I generally avoid talking about climate change, at least in the U.S. where it's such a political hot potato. So instead I demonstrate how profitable it is to reduce your footprint (including carbon), regardless of the science on climate change. My basic logic is this: decoupling our companies and economy from fossil fuels, and oil in particular, is just good business. By reducing energy use and carbon pollution, companies save money, reduce the risk that comes from relying on volatilely-priced fuels, and reap the benefits of taking part in the clean economy, which will drive innovation and generate vast wealth. But it's also a matter of national security (which is why the U.S. Navy is greening itself faster than any company I know). So, no, it doesn't matter if you "believe" in climate change. But every now and then, I have to state clearly what I believe. Saying "it doesn't matter" is true, but it's not leveling with everyone about the depth of the challenge. So here's my belief: The scientific evidence that the earth is warming and humans are the primary cause is vast, overwhelming, and very convincing. We are destabilizing our one home, and it's endangering our economies, communities, and even our species. The fundamental change in how the planet works – which has begun already with record droughts, floods, heat waves, and storms – is larger than we realize.. I think a lot about what a "real" approach on climate would mean for business, which will play a pivotal role in finding and spreading solutions to our energy and climate challenges. While many companies have begun the hard work, they need to step up their game. On the day-to-day level, that means setting much more aggressive carbon reduction goals (80 to 100% reduction by mid-century or sooner). A few leaders, such as Wal-Mart, P&G, and Sony have set 100% renewables (and/or "zero impact") as goals. The rest of the business world needs to follow, and truly lay out a path to get there. On the larger level, companies need to pursue what I call "heretical" innovation that rethinks business models and provides goods and services with dramatically reduced environmental footprint (see my blogs on this, here and here). I see a deep parallel in all of this with one of strategy guru Jim Collins' major principles in Good to Great: "Confront the brutal facts." Collins makes a compelling case that businesses won’t succeed if they don’t tell themselves the truth. The same logic applies to each of us as individuals, and to all of us collectively as a country and planet. It's time to confront our brutal facts -- our climate reality -- and get moving. Planes are now held together by tape, not bolts. It's really, really strong tape, but still. Who knew the maker of Post-It Notes could help keep aircraft aloft? This somewhat frightening factoid is just one of the fascinating things I learned in a recent visit to the St. Paul, MN, headquarters of the perennial innovation leader, 3M. During my daylong visit, I observed a quiet, longtime sustainability leader plugging away, creating new products that will help the world save energy, water, waste...and lots of money. For good reason, the $30-billion company has long been held up as a role model of how to manage innovation. In the sustainability realm, 3M pioneered what now seems like an obvious idea: avoiding pollution before having to clean it up. The company's simply named Pollution Prevention Pays (3P) program has saved many billions of dollars over 36 years. The environmental results of its near obsession with eco-efficiency are frankly astonishing. In the last two decades, 3M has slashed toxic releases by 99% and greenhouse gas emissions by 72%. It's the only company that has won the EPA's Energy Star Award every year the honor has been bestowed. 3M's sustainability leadership has come mainly from its eco-efficiency success, but these practices are increasingly the norm in business. So I was happy to observe abundant evidence of the company pivoting to make sustainability a driver of business growth as well. Before my presentation at an employee event, I listened as CEO Inge Thulin and senior execs from each of the major divisions laid out their strategies. Thulin spoke about sustainability being "embedded...in our new vision" of growth and innovation. Other execs bragged about the high percentage of their division's sales coming from sustainability and "energy preservation." Pipe linings: Every year, due in large part to 250,000 water main breaks, our cities lose 1.7 trillion gallons of treated water (equal to the total water use of the 10 largest cities). To help solve this problem, 3M launched a product that sends a machine down into pipes to apply a fast-setting lining which structurally reinforces them, without having to go to the significant expense of digging them up first. An industrial paint application product/service that reduces toxic solvent use by 70% and is saving customers, mostly auto repair shops, $2 billion from simpler paint operations and reduced waste. It's also a sizable business for 3M. 3M's Novec Fluids, which provide cleaning, coating, cooling, and fire suppression for the electronics industry (chip manufacturing, datacenters, and so on) in a non-flammable, non-ozone-depleting way. It's also remarkably safe for users and technology — you can safely dip an iPhone in the stuff. 3M is a refreshingly humble company: every estimate or "boast" is carefully and conservatively calculated to not overstate the case. For 36 years, the company has used only first-year savings to tally the benefits of pollution prevention projects — that's an effective discount rate of, well, infinity. And with the water-pipe-lining technology, the payback calculation for customers includes only labor savings and overall construction efficiency. A more thorough accounting would add in the significant water and energy savings, as well as reduced impacts on local economies (traffic and business disruption). But there are signs of a feistier attitude brewing. The new CEO is making sustainability, growth, and innovation a powerful trifecta. With Novec Fluids, the team is not only working with key customers and early adopters, but it's also pushing the market toward greener options by advocating for tougher government standards and regulations. This kind of pro-environment lobbying is an advanced sustainability strategy that only real leaders can pull off. Finally, I toured the company's relatively new innovation demonstration center. It's a customers-only, hands-on science museum that proudly demonstrates all that 3M can do through cool combinations of its 46 base technologies. Bottom line: sustainability is deeply integrated in 3M's innovation pipeline, which is the engine of the company. The company's core new product development process includes key sustainability questions and criteria for designers to address. Many companies start talking about sustainability efforts before they've really made significant changes to the company or its products. Although 3M may have the opposite problem — getting too little brand and marketing value out of its efforts — it is usually smarter to execute first, and then tell your story. In 3M's case, it's nice to see the engineers at this quiet company just out there doing it. This is the exclusive, short story of how Diageo North America, with creativity and guts, both in operations and in the senior ranks, achieved the holy grail of carbon emissions reductions. They did it without using carbon offsets — and about 38 years earlier than they had to. Here's what scientists are telling us: the world must cut carbon emissions by at least 80 percent from 1990 levels by 2050 to (we hope) avoid the worst of climate change. This level of change seemed like a pipe dream to many, including me... until I spoke last fall to Roberta Barbieri, the global manager for environmental sustainability for Diageo, the $17 billion spirits company. Imagine my shock, as we talked about setting aggressive goals on carbon emissions, when she casually mentioned that Diageo's North American division — a group with $5.58 billion in sales and 14 production and manufacturing facilities — had already cut emissions 80 percent. The first thing I said was, "Excuse me? !," followed quickly by, "when can I come and talk to you?" It all started in 2008, she told me later, when top Diageo execs had their minds set on doing something big. First, for perspective, they ran the numbers on what it might cost to go entirely carbon free. The back-of-the-envelope calculation was daunting (hundreds of millions of dollars) and included ideas like building bioenergy plants to power some of their largest distilleries — an option that would achieve large reductions, but was in no way cheap. They settled on a still-aggressive goal of 50%, made it public, and, remarkably, crossed their fingers. At about this time, Richard Dunne, an environmental exec, entered the picture and took responsibility for meeting the target in North America. He had a strong suspicion that building an expensive bioenergy plant was not the only way to get there. His team implemented a rigorous process of collecting ideas for emissions cuts and estimating the costs. Then they sorted the results on a massive spreadsheet, ranking ideas by net gain on environmental improvement and then by financial investment. By looking at the largest carbon reduction options first, they could group ideas into three big buckets: 1) low/no cost (the no-brainers); 2) some operating expense increase; and 3) more significant capital expenditures (like the bioenergy plant). Executives initially thought that only major capital projects would reduce emissions significantly. But Dunne's process revealed a surprising number of no-brainers. As a result, Diageo North America achieved a 50% carbon reduction by 2012, mainly with a mix of no- and low-cost initiatives. These project range from easy efficiency efforts like lighting retrofits, boiler upgrades, and installing variable speed drives; to larger, but still economical, changes, such as switching fuels (from oil to natural gas) and cutting back from two boilers to one in a small distillery. Reaching the 50% reduction in North America years ahead of schedule was a pleasant surprise. But Diageo still needed to go further: the economics on reductions in other regions were not nearly as good, so North America needed to close the gap to help the global organization reach its 50% goal by 2015. But even with the expensive bioenergy plant beckoning as a solution, something even more unusual happened at a Canadian distillery, one of the company's largest. Gene Ruminski, Diageo's North American sustainability manager, proposed that the Canadian distillery contract with its utility to supply natural gas harvested from a landfill - a net zero carbon solution that would reduce the carbon footprint for North America by another whopping 30%. But there was a big catch: energy costs would go up more than $1 million per year. This expense was more than the single plant could justify. But then a senior exec, the president of Global Supply and Procurement, got wind of the idea (important point here: this exec sits on the company's internal sustainability council). With his global perspective, he realized that even though the landfill gas solution would increase operating costs for this one plant, it was actually a relatively cheap way to deliver a large reduction in emissions. So he gave the go-ahead and some financial leeway to the plant manager who had to take the annual million-plus hit to his bottom line. As it turns out, the plant's ongoing cost-cutting initiatives had already identified many millions of savings, so Diageo reduced the plant's target for total cost savings to allow for this massive carbon-reducing project. 1) Companies still have much more room to cut energy, water, and waste than they realize. Even a well-run company can find enormous savings from easy, low-cost stuff. 2) Big goals force you to look for big ideas, meaning you can, as Diageo's Roberta Barbieri says, "do more than just turning off the lights." 3) Leadership matters. With a more strategic attitude, you can invest in longer-term value, both tangible and intangible. Flexibility is crucial, as the top exec had to give the plant manager leeway on his savings targets to meet the environmental goal. This last point is really critical. Shifting subtly away from an attitude of "maximize profits this quarter at all costs" does not mean you leap right from capitalism to communism; it just means you take into account a broader definition of value to the organization and community. Flexible thinking about value frees you up to find unique solutions. As a clean tech and impact investor Charles Ewald said to me recently, "the gap between 'capitalism' and so-called 'philanthropy' leaves a lot of room for creativity." I congratulate Diageo for getting creative, finding that chasm, and driving a spirits truck right through it. CVS Gave Up Tobacco -- Could Fossil Fuels Be the Next to Go? The recent decision by drugstore giant CVS to stop selling tobaccoreceived a great deal of attention, as it should. It's a big deal when a US-based, public company chooses to stop selling something. Some have downplayed the move, calling the $2bn in lost sales "a mere dent" in the company's $123bn in revenues. But I challenge anyone to walk into their bosses' office at a big, publicly held company and say, "Hey, let's cut a couple billion from our revenue on purpose." The choice that CVS made, in a culture of relentless pressure on short-term earnings, was brave – full stop. As others have pointed out, it was also a logical decision that was likely good for the business. The free publicity alone was worth a great deal. And the goodwill from many customers should pay off. I realize my family makes an unscientific focus group, but when the decision was announced, my wife said: "We really should go to CVS more and give them some business." I went to a CVS that day. More strategically, a couple of key questions come to mind. First, why did CVS do this? Perhaps they'll just save money. After all, Target stopped selling tobacco in 1996 to cut costs (from reduced shoplifting and anti-theft measures). But I'm inclined to take CVS at face value. Here's what Larry Merlo, CVS' CEO, said about the company's core mission to provide health services: "Cigarettes and providing healthcare just don't go together." That indicates this was a strategic decision about the future of the company. Still brave, but logical. It's a great example of what I call a big pivot – a fundamental shift in strategy and tactics to deal with some big shifts in how the world works. I usually focus more on climate changeand resource constraints as drivers of change, but health and wellness issues are extremely large forces to reorganize a company around as well. The second big question is, what's next? What other items on CVS shelves don't fit the health care focus? Several columns in the Guardian – as well as The Boston Globe – call out the candy, soda and other fatty or sugary snacks still on offer. It's worth considering, in a larger sense, the things many companies are doing today that don't fit with their missions. Does it make sense, for example, for companies that rely heavily on a robust middle class to fight a raise in minimum wages? A century ago, Henry Ford raised wages so more people could afford cars. And on Wednesday, apparel retailer Gap announced it would pay its employees more, raising its minimum hourly rate. How about the use of fossil fuels in business? It may seem like a leap, but for many companies and organizations, using, supporting, and investing in climate-changing fuels goes against their missions. For CVS, we could ask, what's "healthy" about fuels that generate air pollution, which increases asthma and heart attacks, or that destabilize the climate and drive extreme weather that threatens public well being? We can look at many stated visions for organizations and ask whether fossil fuels fit. Take Walmart's "Save money, live better" slogan. We're clearly not going to be living better with extreme weather, droughts and floods. To Walmart's credit, the company is buying significant quantities of renewable energy (not as high a percentage of its energy use a few other retailers, such as Ikea, but still a quickly growing one). At the company's quarterly milestone meeting this week, it announced that 1,300 of its stores use renewables and Walmart de Mexico is now getting 60% of its energy from clean sources. The company makes the case in mainly financial terms, saying it's paying less for energy, or by citing the resilience benefits. Those are great reasons, but a mission check might drive even faster adoption of new technologies. Or consider the universities under pressure to divest from fossil fuels. Most recently, Harvard and Brown resisted calls to divest. They made seemingly well reasoned arguments: they have other means to effect change, their investment portfolios aren't so large as to influence the markets, and there may be hypocrisy in relying on fossil fuels to operate while de-investing. A recent piece in The Nation makes a number of strong counter arguments, including the basic fact that climate change already disrupts university operations. For example, Tulane in New Orleans had to shut down for months after Hurricane Katrina. But perhaps the most powerful argument is that climate change threatens a core mission of a university, preparing students for the world, by changing the world irrevocably. This means the universities may be training a generation for the wrong reality. I recently wrote about three possible paths to getting us off of fossil fuels– government regulation, economics (as renewables get cheaper) and moral pressure. But there may be an important additional pathway that we can see at play in the tobacco example: changing cultural norms. Perhaps CVS has decided, about 50 years after the Mad Men era when everyone smoked, that it's just not cool anymore. So who's going to be brave enough to say no to fossil fuels, without couching it in economic or business-case terms? Who will state clearly that this kind of energy no longer fits with what we want to be? Is the Paris Climate Agreement good enough? Can the world build a low-carbon economy fast enough? These are critical questions for the future of humanity, so it’s important to consider them carefully. But too many people in the press and in the business world are unnecessarily dour about the whole thing. These views on the cost and feasibility of building a low-carbon world are not uncommon in the business world. But they are dated, damaging and dead wrong. We need a broad coalition of business, government and citizens to tackle a problem as large and complex as climate change. Telling people it’s not possible is worse than unhelpful. Luckily, most of the world is now ignoring the naysayers. Before addressing their biggest concerns, let’s stipulate something. Fossil fuels brought billions of people out of poverty. Society has invested for 150 years in infrastructure to power modern life. So of course it’s daunting to contemplate moving the world away from what we know. And many fossil fuel companies and petro-dictatorships are fighting the transition with their immense influence and power. But throwing up our hands and saying “this is all too hard” is not much of a response to a serious problem. And, more important, the reasons for optimism are now bountiful. Let’s look at Brooks’ commentary more closely. He says there are costs, which is a deceptive (or perhaps uneducated) way of referring to smart investments: All business or government expenses are choices about where to put capital. But the weirdest and most dated part of his statement is saying we’ll “never see” the benefits of a clean economy. Quite literally, China will see clearer air by reducing coal use and traffic in Beijing and other megacities. And for business, there’s an enormous range of initiatives that slash costs quickly — such as lighting and building retrofits, efficiency, and now even renewables. Companies like Walmart, Google and Apple are cutting carbon, buying tremendous quantities of renewable energy and saving money doing it. So when is this “never” that Brooks speaks of? The idea that it’s just too expensive to go low carbon is one of thebig myths that are crumbling right now. If anything, the best economic analyses show that not moving away from fossil fuels will be devastating to humanity and our economies — a possible US$72 trillion expense over the next 40 years, according to a report from Citi. The bill for inaction is already starting to come due. Look at the costs of droughts like the one in California, or the immense human and economic toll of the “once-in-a-century” rains and floods in Chennai, India. Ford, BMW and many other multinationals have factories there. Lost production is expensive. Citi’s study also suggests that we can take the trillions of dollars we will be spending on infrastructure and fuel in the coming years and point it toward renewables instead of old, dirty technologies. The total bill will be the same or less, just without the carbon and climate risk. So, far from destroying the economy, the low-carbon world will save it. It’s true that it is a big job to turn over the world’s energy systems. But the need to cut carbon fast is not driven by love of polar bears. It’s about keeping the planet livable and productive for humans and our businesses and economies. 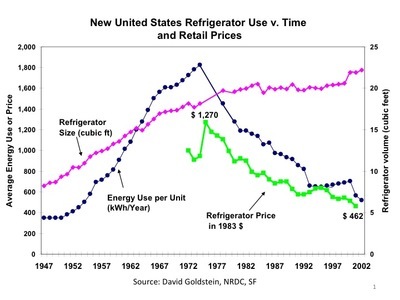 The continuing good news is that the new technologies are getting much cheaper all the time. Solar and wind costs have plummeted around 70 to 80 percent in the past five years, and a number of analyses tell us that, as the International Energy Agency and Bloomberg noted, “fossil fuels [are] losing cost advantage over solar, wind.” The world seems to have noticed this economic shift: More than half the new energy built today is renewable. Murray has his concern about wildly unrealistic expectations, but I have a practical point. It’s true that it is a big job to turn over the world’s energy systems. But the need to cut carbon fast is not driven by love of polar bears. It’s about keeping the planet livable and productive for humans and our businesses and economies. We’ll do what’s required because we have to, based on physicsand economics. It’s a strangely defeatist attitude to declare visionary thinking as unrealistic. Imagine rewinding the clock 25 years, when some were likely predicting a cellphone in every hand or magical portable computers that would give everyone access to the world’s knowledge. I’m sure many said it was impossible, but most in business probably eagerly embraced the massive multi-trillion-dollar build-out of the mobile industry in the 1990s and 2000s. So why not get excited about the trillions moving us toward a more resilient, distributed-energy, renewable-based world? I prefer to get my predictions from optimists — people like Tesla’s Elon Musk who are painting a world of electric cars and renewable energy and moving forward to build it. And now we have the biggest source of optimism to date: In what is perhaps a first in human history, representatives from nearly 200 nations agreed in Paris to cut emissions over the next 10 to 15 years. Yes, the deal has huge flaws. It has limited repercussions for countries not meeting targets, the tracking and transparency could be stricter, and even if we meet the current targets, we come up far short of slowing warming to 2 °C. Companies are coming off the sidelines now for real, committing to serious reductions in carbon and massive investments in renewables. But these are all problems we can deal with if everyone is on board. And, most importantly, the deal tells business and the markets that governments are serious. Investing in building the low-carbon economy just got even more rational. Why, then, is the carping from the sidelines usually couched as the more reasonable, sober position versus pie-in-the-sky or naïve activists wanting a renewable-powered world? It’s easy to be depressed about the situation we’re in. Corralling close to 200 countries to act in collective best interest is obviously hard. And the science is not helping, because the climate problem is moving fast (I’m sick of seeing headlines like “The Arctic is melting faster than scientists thought”). But the reasons for hope are now plentiful: from rapidly improving economics, to serious action in the business community, to global citizen and political will-building. Those denying we have a problem are being sidelined within nearly all governments (except the U.S. Congress) and increasingly, I find, within executive suites and boardrooms. Companies are coming off the sidelines now for real, committing to serious reductions in carbon and massive investments in renewables. Globally, we’ve finally achieved a consensus that there is a serious problem. We’re nearing consensus that it’s in our economic and moral interest to do something about it. So it’s time for everyone to join the parade, criticize only when it’s productive and suggest real solutions that help us build a thriving world. I have a new quarterly column for MIT Sloan Management Review. Logically, I'm the sustainability guy, but I'll be leaning into technology topics as well. Here's my first piece (also here), where I talk about the change in expectations of companies and in the goals they set on environmental and social issues. I'll have more on how those goals have evolved in a future blog (I just ran some great data from pivotgoals.com). Enjoy. Technically, that’s true (ish), but it’s also meaningless. On the surface, the facts are a bit exaggerated — fossil fuels provided more like 80% of our energy in the United States in 2016. But even if it’s roughly correct, who cares? The future belongs to renewable energy and clean technology. The majority of the new energy capacity put on the electrical grid — both globally and in the United States — now comes from renewables. In 2016, wind, solar, biomass, and hydroelectric energy accounted for 63% of the additional capacity built in the United States, and an amazing 86% in Europe). As for our transportation systems, a growing list of countries, including France, Norway, the U.K., India, and China, have announced either future bans on selling diesel or gas cars or official targets for electric car sales. Automakers are also moving quickly: Volvo, for instance, has said that in just two years, it will stop making cars that have only an internal combustion engine — that is, every car will be electric or hybrid, with both a battery and smaller engine. So the fossil-fuel sector is waging a losing battle. But the billboard got me thinking about a more general point for business: It’s not smart to base any part of your strategy on what you see in the rearview mirror. And that’s particularly true when you develop strategies for navigating modern, thorny environmental and social challenges. If you run a business (or a government) as if the future will look exactly like the past, you will become irrelevant. The list goes on and on. Many of the companies in those industries have ignored the “dead man walking” aspect of their business, especially when those that dominant market shares. But their downfalls became classic cautionary tales — think film company Eastman Kodak Co. and video rental chain Blockbuster LLC. The history of technology adoption is pretty clear, and it’s speeding up. Try to imagine some past billboards announcing (proudly!) 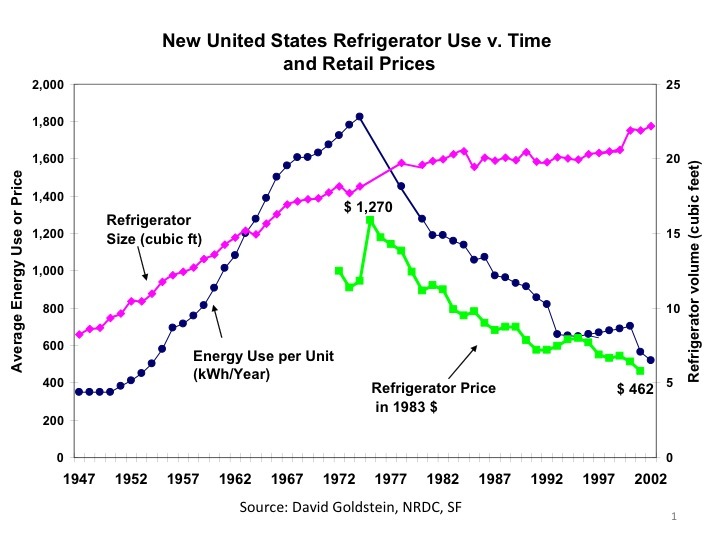 that 90% of TVs are black-and-white, or that 90% of food preservation is from salt, not this newfangled “fridge” thing. Now make the small leap to think beyond shifts in what’s normal in technology or the energy sectors. Social change also comes to the world — and to business — fast and furious. At distinct moments in the history of the developed world, 90% of elite college students (and corporate new hires) were white males, and 90% of companies would not even think of having domestic partner or LGBT policies. In Saudi Arabia, until just a few weeks ago, men drove about 100% of the car miles. My larger point is that change is coming to business — and executives need to adjust. The norms and expectations about how companies manage environmental and social issues are shifting fast. Just six years ago, only 20% of the S&P 500 companies produced sustainability reports. By 2016, 82% did, providing public, detailed looks at their environmental and social actions and performance. A growing number have integrated these sustainability reports into their annual financial reports. My company keeps a public database of the sustainability goals set by multinational businesses. These commitments include statements such as “reduce greenhouse gas emissions by 50% by 2025” and “ensure women make up 40% of management roles.” Roughly 85% of the 200 largest companies in the world now have public targets on social or environmental performance — and it’s actually over 90% if we exclude Chinese government-owned enterprises, which don’t often set individual targets separate from government planning. More than 100 of the world’s largest companies have now committed to 100% renewable energy. Ten years ago, the number of large companies with renewable energy goals, or any sustainability targets, was negligible. We’re in the early stages of big shifts in how companies do business more sustainably, with much more attention to their role in society. Most companies are aggressively reducing their own operational footprints. But that’s arguably just table stakes. A growing number of companies are engaging with the broader world in ways that were rare until quite recently. U.S. CEOs are taking public stands on issues from LGBT rights to immigration. After the state of North Carolina passed a bizarre bill that mandated which bathrooms transgender people could use, dozens of large company CEOs wrote an open letter to the state’s governor saying that the legislation is “not a bill that reflects the values of our companies.” What percentage of large companies would’ve spoken out on something so socially sensitive five years ago? So what’s coming next? On technology, as always, plenty. For example, I’m sure that 90% of companies do not have artificial intelligence deeply embedded in their operations today. But how long do you want to bet it will be until Siri, Alexa, and Watson get together to change that statistic? Technology is always changing, so that’s nothing new. But a far deeper change is brewing. Business faces rising expectations from society, and that shift is changing the nature of strategy and competition. On all megatrends, but particularly sustainability, look beyond what the 90% are doing right now. Even with all the talk about carbon footprint and renewable energy, the vast majority of companies have not made climate action or sustainability a top priority. Based on my experience with multinationals, I’m confident that 90% of large company C-suite execs still believe that their primary (and often only) goal is maximizing shareholder value. It’s a new world for business, and expectations keep rising. Looking at yesterday’s norms will make your business outdated and irrelevant. So, look forward to be part of — or better yet, to help create — a thriving future.